GFXBench 3.0 is the first comprehensive cross-platform OpenGL ES 3 benchmark designed for measuring graphics performance, render quality and power consumption in a single, easy-to-use application. Developed in cooperation with industry leading partners, GFXBench 3.0 is a high-end 3D graphics benchmark that adds advanced OpenGL ES 3 features and special tests to the popular GFXBench benchmark suite. The new Manhattan scene is a true GPU-intensive test for the latest mobile devices, utilizing OpenGL ES 3 capabilities such as multiple render target for deferred rendering, geometry instancing, transform feedback and many more. The convergence of handheld and desktop GPU performance and the intense competition in the semiconductor and consumer electronics market have made it necessary to go beyond simple graphics performance measurement and develop additional tests for power consumption, performance stability and render quality. Optimizations for reaching higher short-term GPU performance could negatively affect end-user experience by resulting unexpected performance drops, quality deterioration or increased battery drain. Kishonti’s comprehensive testing tool provides a solution to expose these effects to vendors, the technology press and consumers alike. The new Battery and Stability test measures the device’s battery life and performance stability by logging frames-per-second performance (FPS) while running sustained game-like animations. In addition the Render Quality test measures the visual fidelity in the same complex scene. In order to offer a trustworthy professional benchmark for the widest audience, the consumer version available on the popular applications stores contains all the test features included in the corporate edition. 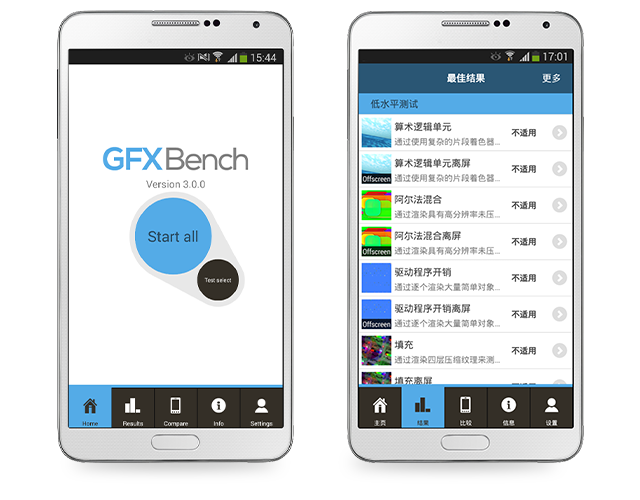 GFXBench 3.0 also features multi-language support, with a number of localized versions (such as Chinese and Japanese). A new, user-friendly UI is introduced which enables test selections for more customized testing, device comparisons within the application by downloading the full GFXBench database, and accessible results history management. Besides, an extensive system information feature gives feedback on the details of the tested device. The Android version is available for download now, further versions for iOS, Mac OS, Windows 8, Windows Phone 8 and Windows RT will be rolled out soon. The corporate version is already available for licensing. It works without network connection, allowing for companies to run confidential test sessions during development. Besides, the corporate license includes professional support and porting to all requested platforms. Kishonti Ltd. is a leading specialist in high-performance graphics and compute solutions. In the past decade we have been working together with leaders of the semiconductor and consumer electronics market listed among top ranking technology companies of the NASDAQ-100.